The railway uses switchbacks to overcome the local steep inclination and the altitude difference of 217 metres. 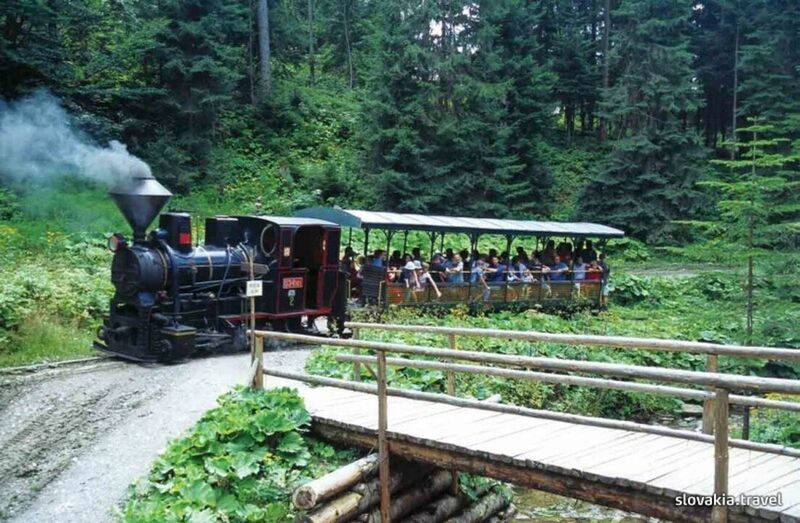 It began to operate in 1926 after two separate forest railways were connected - the Kysuce railway running from Oščadnica to Chmúra and the Orava railway running from Lokca to Erdútka, which gave rise to the connecting railway Chmúra - Erdútka. Both railways with a gauge of 760 milimetres, which were constructed between 1915 and 1918, were used for transport of timber. The original track was 61 kilometres long. The length of the railway track including all turnoffs amounted to more than 110 kilometres. The railway was used until 1971. The whole railway, except for an eight-kilometre long stretch, was dismantled in 1972. The 3.4-kilometre long stretch from a settlement called Kubátkovia to the first switchback, which has been in operation since 1994, lures many tourists. It passes through the area of the Museum of the Kysuce Village, which displays 34 buildings presenting folk architecture from various corners of the Kysuce region. Offering ski-to-door access and a ski school, Penzión Severka is located in Oravská Lesná in the Žilinský kraj Region, 39 km from Wisła. The guest house has a children's playground and ski storage space, and guests can enjoy a meal at the restaurant.